GK Questions from Grand Slam tournaments are very important for bank exam, SSC and other competitive exam, here is list of winners in Grand Slam Winners 2017 and make it in PDF format. We Hope it will definitely help you for your upcoming Exams. 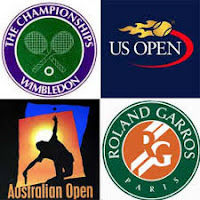 The Grand Slam tournaments, also called majors, are the four most important annual tennis events. They offer the most ranking points, prize money, public and media attention, the greatest strength and size of field, and greater number of "best of" sets for men. The Grand Slam itinerary consists of the Australian Open in mid January, the French Open in May and June, Wimbledon in June and July, and the US Open in August and September.